The 2018-2019 season has come to an end and each year upon the completion of the regular season, the Generals present their annual awards to the team. 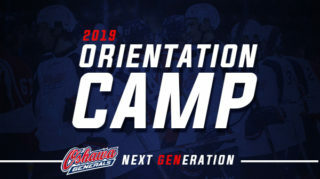 The awards exemplify the culture of the Oshawa Generals and the winners this season have demonstrated outstanding individual performances, leadership, academic achievements and community involvement. 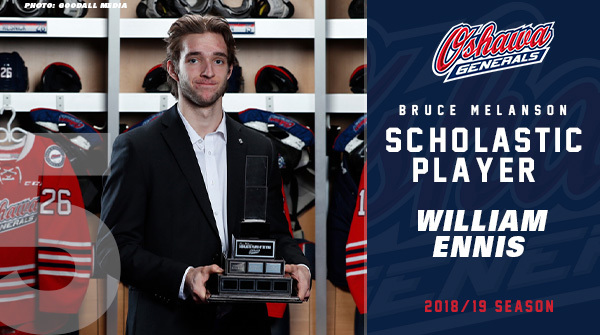 William Ennis is the Scholastic Player of the Year for the 2018-2019 season. Enrolled in classes at UOIT, Will has taken on the workload of university classes including Chemistry. “William is a very dedicated and personable individual, who leads by example demonstrating a strong work ethic” said academic advisor Tom Buchanan. 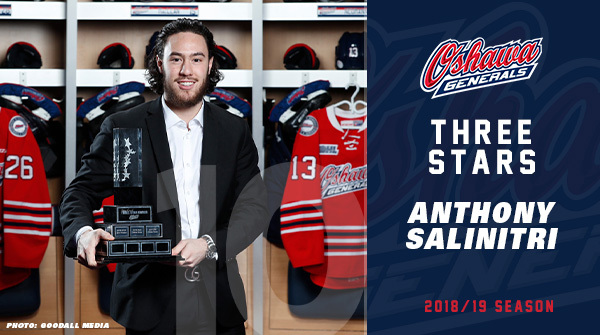 Anthony Salinitri is the winner of this season’s Three Stars Award. The three stars are awarded at every game to the players who had the biggest impact in the game. Anthony was named a star in 10 home games this season, leading the way for the Generals. Salinitri finishes the season with 88 points, a personal best and finishes 14th in league scoring. Salinitri claims top spot in the league with 7 short handed goals this season to go along with his 3 home ice hat tricks. 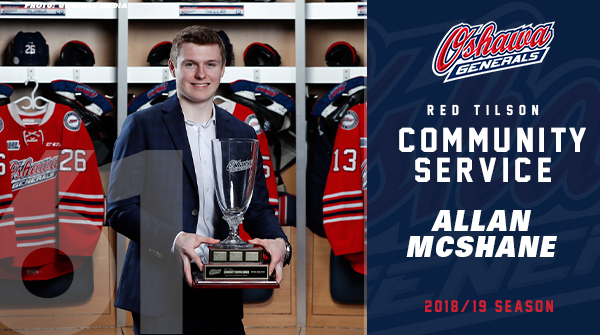 Allan McShane is the 2018-2019 Community Service Award winner for time dedicated to the community over the course of the season. Allan attended multiple events in the Durham Region where they were able to interact with fans, attend charity dinners and take part in numerous school and hospital visits. He attended the Gens annual backyard rink skate for the second consecutive season and his always willing to lend his time to other community service efforts. 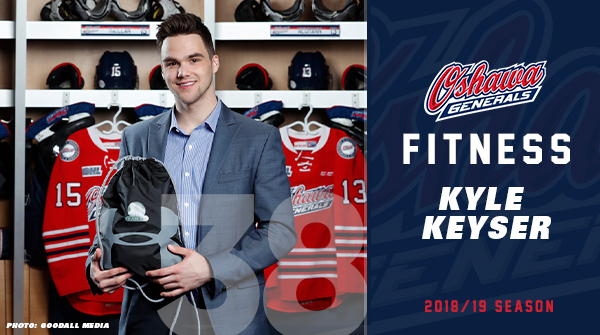 Kyle Keyser is the recipient of the 2018-2019 Fitness Award. Hard work on the ice and dedicated effort in the gym, Kyle showed growth and commitment to his physical fitness. The winner of this award receives a prize package from our partners at Elite Training Systems. 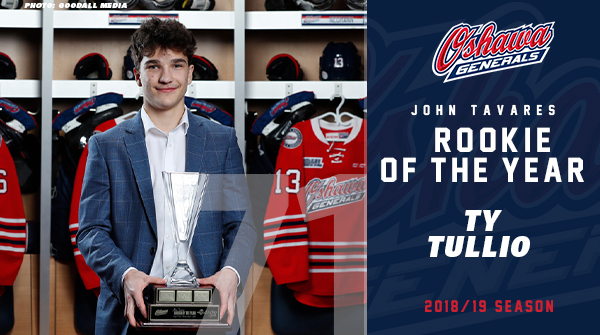 Rookie of the Year honours goes to forward Tyler Tullio. 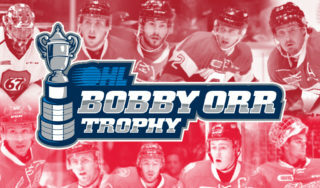 In his first OHL season, his presence was felt on the team over the course of the year. Recording 15 goals and 27 assists for 42 points in 60 games played in his rookie campaign, Ty finds himself sitting 14th on the Generals rookie scoring list (calculated from ’89-90 season onward) and finishes the season sitting 6th in league rookie scoring. Ty also had a charity this season supporting the Durham Region Boys and Girls Club and their breakfast program initiative. Brandon Saigeon finished a top the leader board in points for the Generals for the 2018-2019 season. He takes home the Top Scorer Award after a stellar final regular season game just passing teammate Anthony Salinitri to claim the title. Brandon finishes the season with 92 points, a personal best. This season he was over a point per game player and saw increases in his point totals across the board. 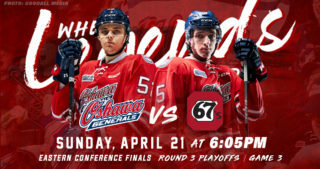 He finishes 6th in Generals over age scoring (calculated from ’89-90 season onward) and finishes 12th in Ontario Hockey League scoring for the 18/19 season. 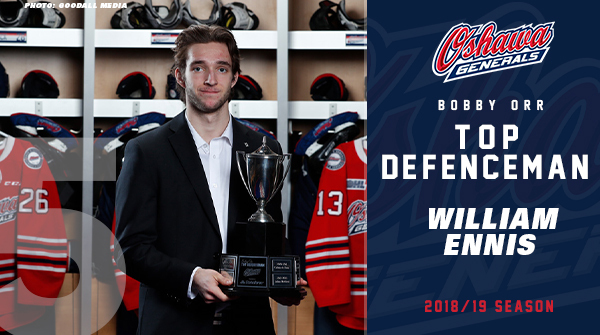 William Ennis is the Top Defenceman for the 2018-2019 season. He lead the team in plus/minus with a plus 27 rating. He saw an increase in point totals in all categories this season and is a consistent force on the back end for the team. Ennis finishes the season with 16 points, including 3 goals, all personal bests. 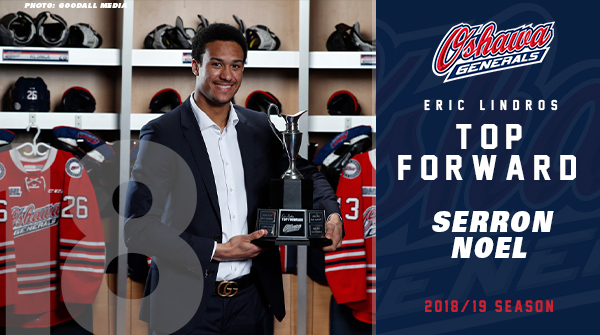 Serron Noel also claims Top Forward honours. Appearing in 68 games this season, Serron finished with 34 goals and 47 assists for 81 points, finishing 22nd in league scoring. He broke the 30-goal mark for the first time in his OHL career and finished with plus/minus of 16. The Florida Panthers prospect just recently signed an entry level contract with Florida. 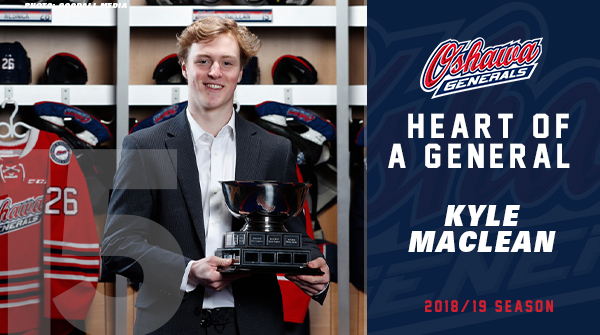 The Heart of General Award goes to the player who embodies what it means to be an Oshawa General. 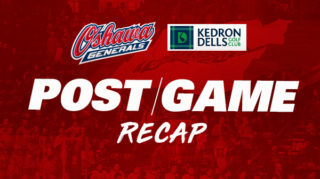 This season’s winner is Generals captain, Kyle MacLean. 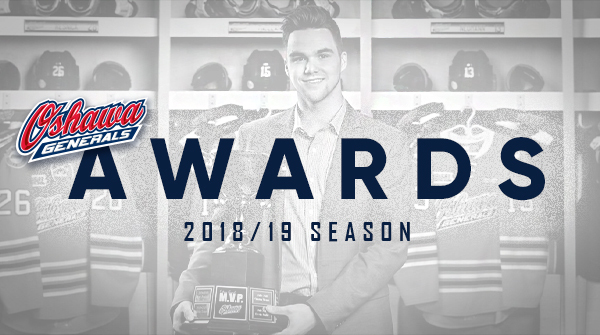 Kyle demonstrated the core values of this award, belief, commitment, excellence and trust on and off the ice over the course of the season. On top of showing great sportsmanship, Kyle went on to have a career season, generating more than double his points totals from previous seasons finishing with 18 G, 42A, 60 PTS. 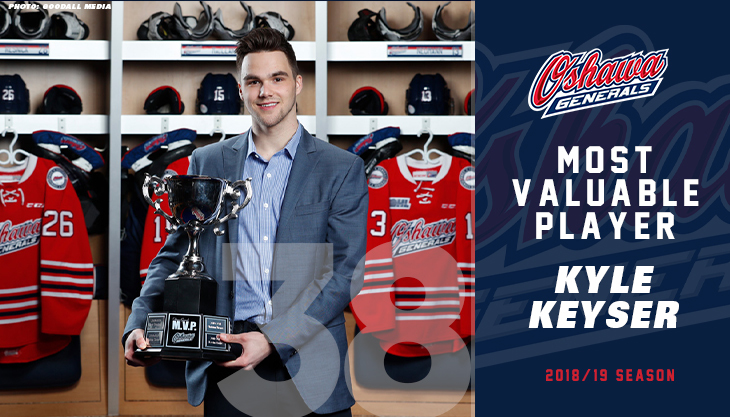 The 2018-19 season MVP is none other than Kyle Keyser. The Boston Bruins prospect has been a staple in goal for the Generals all season long, backstopping the team in 32 wins this season. Keyser is a player the team relies on in goal and is always there to come up with a big save when needed. Having his best season on record, finishing the year with a 2.75 GAA and a .915 SAV%. 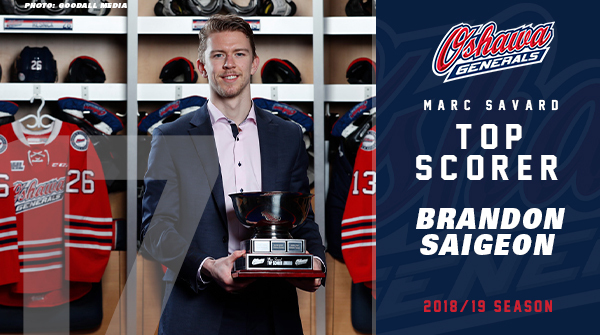 He finishes the year ranked 4th in Goals Against Average and 2nd in Save Percentage in the Ontario Hockey League. 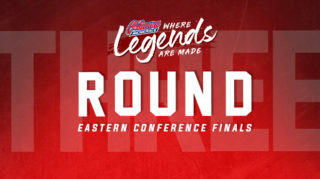 Get your tickets to see all our winners as we continue into the post-season! 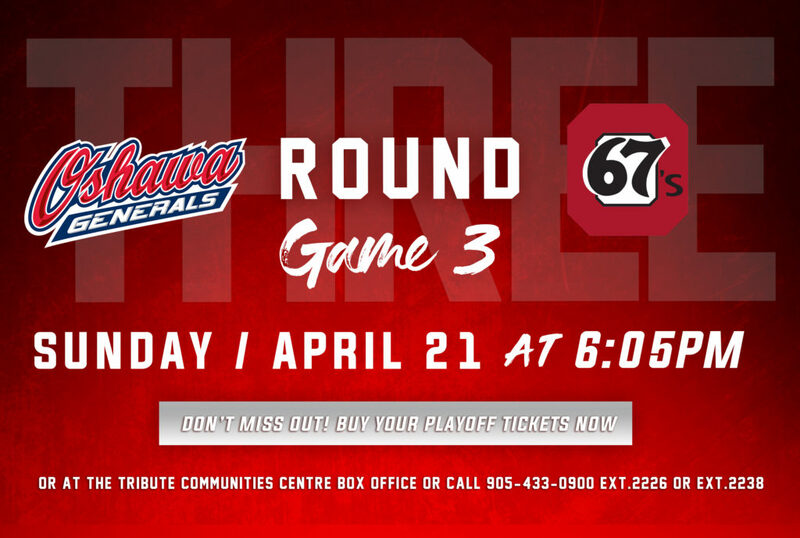 2019 Playoff Tickets are on sale NOW for the Eastern Conference Quarter Final Series vs. the Peterborough Petes—click here!